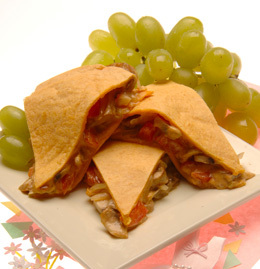 Quesadillas are the Mexican version of a grilled cheese sandwich but with more flavour from additional fillings. Great for lunches, snacks or appetizers. Place pepper on the cutting board; with the sharp knife cut pepper in half vertically and cut out the stem. Scoop out seeds with small spoon; with sharp knife cut pepper into narrow strips. With sharp knife peel onion; on the board; cut in half vertically. With flat side down on the board cut each half into narrow slices. Put 5 tsp (25 mL) oil in large non-stick skillet. Put the skillet on a burner of similar size and turn it on medium heat; add peppers, onion and mushrooms, cook stirring constantly with large spoon for 5-6 minutes or until lightly browned; turn off burner and with oven mitts remove skillet to another burner that is cold. Press or crush garlic into mixture; stir in jalapenos if using. Preheat oven to 425ºF (220ºC). In small bowl mix cream cheese, chili powder and cumin with the small spoon until smooth. Place 1 tortilla lightly greased baking sheet; using the back of the spoon spread the cheese mixture evenly over that tortilla. Spoon the mushroom mixture evenly over that tortilla; sprinkle shredded cheese over all. Place the other tortilla on top, pressing down lightly. Brush remaining 1 tsp oil (5 mL) on top tortilla. Place baking sheet in middle of oven and bake for 8-10 minutes or until lightly browned and crisp on top. With oven mitts remove tray from oven to cooling rack. Let rest 5 minutes and then using pizza cutter or sharp knife cut into 8 wedges. Pass salsa and sour cream if you like.